Snaidero Middle East, home furniture supplier and producer, meets modern and classic tastes for interior design. 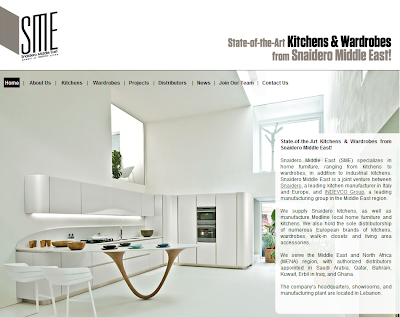 Snaidero Middle East launches new vibrant and visually-appealing website. The website displays vivid images, allowing visitors to get a feel of the wide array of Italian kitchens and local home furniture and wardrobes. The website helps customers get in touch with the right Snaidero Middle East distributor by listing all distributors per country: Ghana, Iraq, Qatar, Lebanon, and Saudi Arabia. Furthermore, website visitors can keep up-to-date with the latest Snaidero Middle East news. Snaidero Middle East supplies a large range of Snaidero Italy kitchens to households in the region, as well as offers Wery industrial kitchen equipment to the hospitality sector. Furthermore, Snaidero Middle East manufactures Medline kitchens and closets at the Lebanon-based plant. Established in 1996, Snaidero Middle East is a joint venture between Italian kitchen manufacturer, Snaidero, and multinational manufacturing group in the Middle East, INDEVCO Group. Located in Lebanon, Snaidero Middle East holds sole distributorship of numerous European brands of kitchens, wardrobes, walk-in closets and living area accessories. Snaidero Middle East serves the Middle East and North Africa (MENA) region, with authorized distributors appointed in Saudi Arabia, Qatar, Bahrain, Kuwait, Erbil in Iraq, and Ghana.